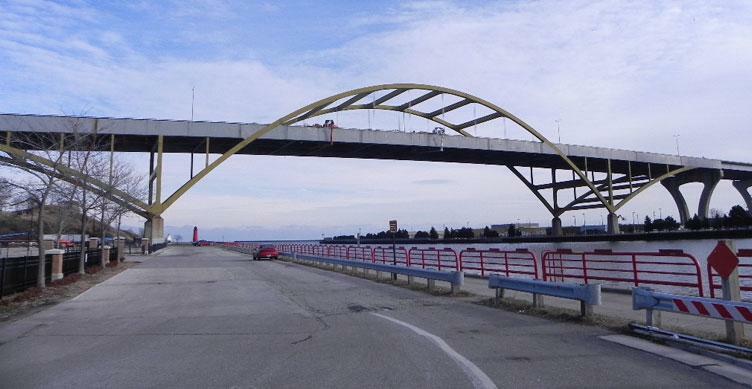 This bridge painting and lead abatement job on the Hoan Bridge project in Milwaukee, Wisconsin is providing Thomas Industrial Coatings crews with the perfect opportunity to demonstrate their proficiency in installing Safespan’s temporary platform systems. Lead abatement on the bridge is scheduled to begin once a Safespan temporary platform installation is completed. As temperatures rise next spring, crews will begin an abrasive blast on the structure, bringing it down to a bare metal before applying a three-coat protective coatings system of zinc epoxy and urethane. Crews will also be performing spot abatements on the bridge in places where structural steel repairs are required. This will prevent ironworkers at the site from being exposed to harmful chemicals while cutting and welding. Thomas Industrial Coating is aiming to have lead abatement completed by the end of summer, 2014. Before moving forward with lead abatement on the Hoan Bridge, which spans the Milwaukee River near its confluence with Lake Michigan, Thomas needed a system for lead containment. Crews knew they needed to wait for warmer weather before lead abatement could begin high on the bridge, which presented a problem. A large portion of the bridge runs above Milwaukee’s famed Summerfest grounds. This meant that the warmer weather needed for lead abatement to begin would also bring with it crowds of festival-goers for the summer season. Running tarps from the bridge completely to the ground was out of the question. Luckily, Thomas Industrial Coatings is a leading installer of Safespan temporary work platforms. These platforms, customizable to fit the job at hand, can be sealed with tarps for lead abatement. This prevents potentially hazard materials from escaping into the environment, without disturbing scheduled events at the Summerfest grounds below. Additionally, the platform will aid general contractors by acting as a net to catch debris once the road deck removal begins. Crews hope to finish the Safespan installation by April of 2014, with significant portions handed over to the general contractor by March.